Distortions from both low and high base effects have normalised during February as indicated by the headline inflation reading published this week by the Namibia Statistics Agency. Annual inflation for February came in at a very steady 3.5%, only one tenth of a percent lower than the January headline inflation of 3.6%. Month on month inflation has also reverted to mean with a reading of 0.1%, in line with monthly inflation for the whole of last year, but normalising from the 1.6% jump last month. 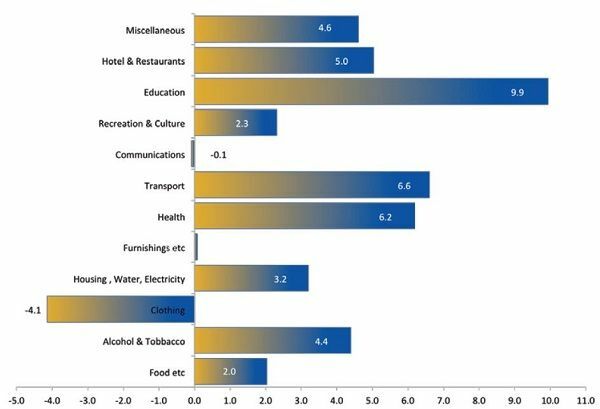 Due to the category weighting applied, Namibia’s overall inflation is driven mainly by only four categories, housing & utilities, food & non-alcoholic drinks, transport, and alcoholic beverages & tobacco. These four categories combined constitute 72% of the total basket of goods and services measured every month to determine inflation. The main culprit in February’s inflation reading was the education sector where prices increased almost 10%. Two other industries where productivity is falling are Transport with a 6.6% increase and Health with a 6.2% increase. The inflation basket is due to be rebased this year as it was last rebased in 2013. PreviousKatutura State Hospital gets lion’s share of new medical equipment from Support Ulm e.V.